If you’re wondering, “I’m registered, now what?”, you can follow this guide for a tour of how the program works. Schedule & Deadlines: A complete list of deadlines, workshop and tournament dates. Regions & Teams: Provides detailed information on each regional event including a list of registered teams. Registration Policy: Includes details on what you’ll need to participate along with policies on registration incentives, payments and withdrawals. Scholarships: If your team will be applying for a Botball® Scholarship, please read the Scholarship Policy in full. If you have a question that is not addressed below, please read our FAQs & Policies or contact us here. The Botball® season begins with a 2-day professional development workshop where team leaders, mentors and students will learn about current robotics technology by participating in a variety of interactive exercises and activities. The hands-on workshop covers basic robot elements, processors, sensors, motors, programming in KISS (C), feedback and control, robot construction and Botball® game rules for the current season. Workshops are held on Friday and Saturday or Saturday and Sunday depending on the region. Sessions run from 8:00 a.m. to 5:00 p.m. each day and each team may bring a total of 3 people to the workshop. 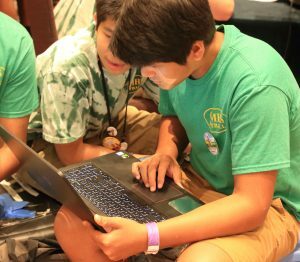 Teams attending the workshop will receive their complete reusable Botball® robotics kit, a link to online curriculum and resource materials, rules for the current season Botball® game, and rules for the Botball® online documentation. Teams will need to bring an extension cord, power strip, and a laptop computer or device with wifi capability and/or USB ports. It is critical that teams have administrative passwords and/or privileges to install the USB driver if they want to use it to program their robot. Workshop participation is optional, but strongly recommended. However, new teams receiving scholarships are required to attend their regional workshop. Each registered team may bring NO MORE than 3 people to the workshop, of whom at least one person must be a teacher or mentor. (If you have more than one team, there must be at least one adult per group of three.) Unfortunately there can be no exceptions to this rule. Photographs will be taken during the workshop. Photos may be used in publications or other media material produced, used, or contracted by KISS Institute. Any participant who prefers not to have their photo taken or distributed must let the workshop instructor or a KIPR staff member know prior to the start of the workshop. Tournaments provide a fun atmosphere for teams to showcase their work. Teams begin by running 3 unopposed seeding rounds to determine their rank for the double elimination portion. After seeding rounds are complete, all teams participate in an exciting double elimination tournament where they play against one another in an equitable draw bracket. The day culminates in an Awards Ceremony. Teams are provided a Pit Area where they can modify their robot and programming between rounds. The Pit Area is strictly for student use only and no teachers, coaches, mentors or other adults are allowed in the Pit Area on tournament day. Teams are expected to bring their own laptop, power strip, and extension cord. · Robots must be completely student built from the Botball kit of approved parts. · Robots must be completely student programmed. · All judges’ decisions regarding scoring are final. · Trophies and certificates are awarded in the following categories: Overall, Double Elimination, Seeding, Judges’ Choice, and Documentation. Call us at (405) 579 4609, Monday through Friday, 9AM – 5PM Central Time. See our contact page for additional contact information. The Botball® robotics program allows for flexible team structures that can be tailored to fit the needs of each team. With no minimum or maximum number of students allowed per team and no school affiliation requirements, Botball® encourages involvement from all types of student groups. Botball® teams are typically made up of 10-15 students. While many teams are affiliated with schools, some teams are organized through clubs such as 4H or Girls Inc. Others are community teams that are made up of a group of students who are home schooled or whose schools are not participating. Any team of middle or high school aged students is eligible to participate as long as they have an adult team leader. The Botball® program can be implemented in a number of ways. Some teachers integrate the program into their regular classroom activities, while others offer the program as an after school activity, usually in conjunction with a robotics/technology club. When involving a large number of students on one team, it is often helpful to split the team into focus groups who will then focus on one specific part of the program. Your team may want to consider implementing focus groups such as: a building team, a programming team, a documentation team, a website team, a publicity team, and a project manager. As each Botball® kit has enough materials to create two robots; you may also choose to divide the group into two teams, each building their own robot. There are a variety of ways to get students involved in Botball® and as such, we’ve included a few ideas to help jump start your recruiting efforts. Enlist the help of other student organizations. Organizations such as your school’s newspaper or yearbook staffs may be interested in helping to document your team’s progress through school and community newspaper articles and photographs. In addition, students in art classes might be interested in working on the graphic design portion of your website. Use school wide announcements, fliers, and visits to other club meetings to advertise an informational meeting for any students interested in designing robots using LEGO® pieces. Be sure to make clear the date, time and place of the meeting. Ask science, math, technology teachers and guidance counselors to submit names of students who might be interested. Invite those students to the interest meeting. Give a presentation at a PTA meeting to let more parents know about the program and/or host a night time parent meeting for any parents who might be interested in encouraging their child to join the club and/or interested in helping with the after school program (supervising, supplying snacks, grant finding or mentoring). When giving a presentation or hosting a meeting, you may want to have access to the Botball® website so you can show photos and movies. You may also want to try inviting a Botball® team from a nearby school or last year’s Botball® team to give a robot demonstration at your meeting or presentation. Just like professional work groups, Botball® participants must form a functioning team in order to be successful. As such, you may want to schedule your first team meeting soon after your Botball® Educators Workshop to allow for a little team building and logistics time with your team. You may want to begin your first meeting by using visual tools such as past tournament videos to get students excited and help them understand what Botball® is and why they are participating. The first meeting is also a great time to gather information on each student’s skills and interests and identify roles for each team member. At this point you may also want to decide on a time for regular meetings and work time, as well as answer any questions the students may have. Now that everyone has been assigned a position within the team, you may want to lead the students in team building exercises to get them better acquainted and comfortable with each other. You could also use this time to get the group excited by discussing strategies for this year’s Botball® game. Below is a summary of fundraising for your Botball®team. For more information and proven ideas, see the team fundraising page. · Build & Program Robots – Take Pictures! · Attend Botball® Tournament – Take Pictures! For more information and proven ideas, see the team fundraising page. Throughout the Botball® season, your team should use the Team Submissions tab under the Homebase to post various documents detailing your team’s progress. Botball® Online Project Documentation activities are a required element of the Botball® program and factor in to each team’s final score at their regional tournament. The Botball® Kit materials vary from year to year, but each year’s kit includes a variety of LEGO® building materials, compatible metal parts, an iRobot Create®platform, and a variety of screws, nuts, and bolts and other materials. A variety of servos and motors are provided with each year’s kit, as well as the necessary wires for controlling them from the controller, and assorted gears to increase or decrease motor force and speed as needed by the design of your robots. These serve as the “muscles” of your robot, and will be used to maneuver your robot, lift reaching arms, close grasping claws, and otherwise power the tools you give it for playing the Botball® game. Along with the integrated camera, a variety of analog and digital sensors are provided with your Botball® Kit. The included sensors will allow your robots to “see” the starting light, measure the distance to various objects, find objects of specific colors, and collect all the other information that they will need to succeed in the Botball® arena. Each year, the Botball® Kit includes 2 Robotics Controllers. These controllers serve as the “brain” for Botball® robots, storing programs that your team has written to control your robots actions in the game. Programs running on these controllers can take input from a variety of sensors, and control a variety of motors and servos to maneuver your robot through the challenges of the Botball® game. Botball® teams write programs to control their robots in a language called C using our KIPR Software Suite which is on the KIPR Wallaby Robot Controller. You can download the latest firmware for the Wallaby controllers from the KISS Institute for Practical Robotics website. If you are new to computer programming, don’t worry, the Botball® Educator Workshop at the beginning of the season will get you started.